Co-Chair – If Chair resigns or is unable to serve for any reason, the Co-Chair steps in and assumes Chair duties and responsibilities; records WCO business meeting minutes in absence of recording secretary. 2 or more years continuous sobriety suggested, serves through September 30, 2020. 12 Step Call Committee Chair – Maintains a list of 12th Step Volunteers for participating groups; receives calls from Hotline volunteers; and refers 12th Step volunteers to incoming calls (2 years or more continuous sobriety suggested, serves through September 30, 2019). Activities Chair – Leads a committee that holds regular WCO sponsored events. 1 or more years of sobriety is suggested, serves through September 30, 2019. 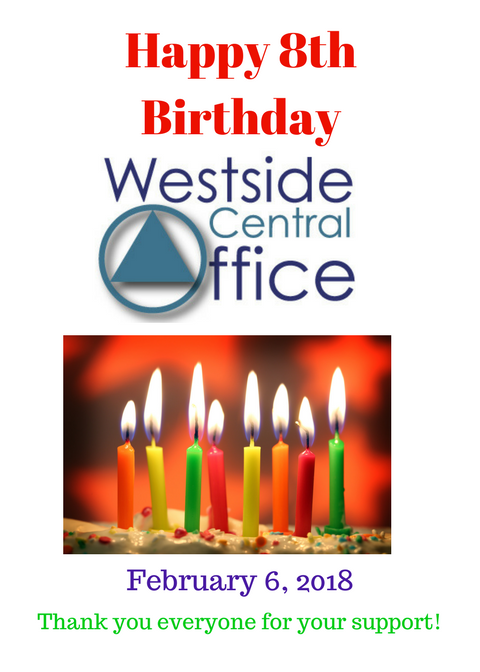 Newsletter Committee Chair – Publishes the Westside Central Office’s monthly newsletter Into Action! 2 or more years continuous sobriety suggested, serves through September 30, 2019. Public Information Committee Chair – Informs the public on “what A.A. is” and “what A.A. is not” through literature, presentations, and public service announcements. 2 or more years continuous sobriety suggested, serves through September 30, 2020.
Corrections Committee Chair – Leads a committee that carries A.A.’s message to the alcoholic behind bars. 2 or more years continuous sobriety is suggested. Serves through September 30, 2020. Office Volunteer – Job duties include opening and closing the office, selling literature, and answering questions about A.A. to anyone who stops by the office. 2 or more years continuous sobriety is suggested. Note: This is an appointed position. 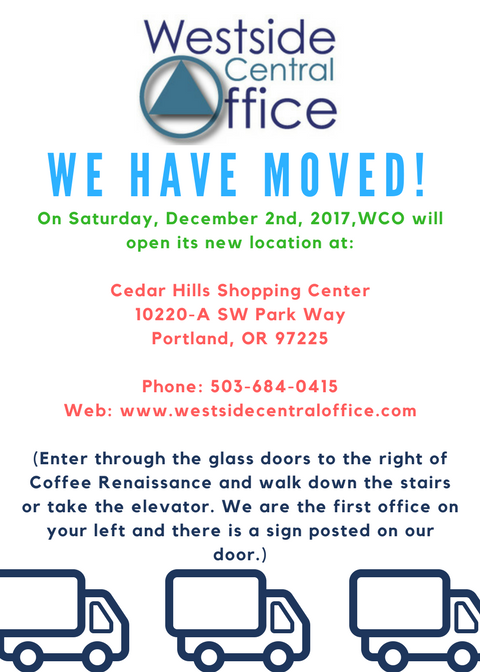 Please email your availability to info@westsidecentraloffice.com or call us at 503-684-0415 (menu option 0). Office Volunteer Chair – Assists the Office Manager (or Board of Directors) with finding A.A.s to volunteer at the WCO facility. 2 or more years continuous sobriety is suggested. Serves through September 30, 2019. Office Manager – Manages the Westside Central Office and its volunteers. 5 or more years continuous sobriety is suggested. Serves through September 30, 2020.Note: Office Manager is appointed by the Board of Directors. Please email your service resume to info@westsidecentraloffice.com. Assistant Office Manager –Assists the Office Manager in their duties. 3 or more years continuous sobriety is suggested. Serves through September 30, 2020.Note: Assistant Office Manager is appointed by the Board of Directors. Please email your service resume to info@westsidecentraloffice.com. Detailed job descriptions for each service position are available here. Interested candidates are encouraged to submit their service resume at a business meeting or by email at info@westsidecentraloffice.com. You may also contact us for more information. The Winter 2019 Meeting Schedule from the Westside Central Office is now available. These printed meeting schedules cover the Western Portland Oregon metropolitan area. They are free of charge, however, if you would like to help us cover printing costs, a voluntary contribution of 50 cents per schedule is welcome. Stop by our office to grab one for yourself or some for your group. The Winter 2019 Westside Central Office Literature Price Sheet is now available. WCO Celebrates its 8th Anniversary! 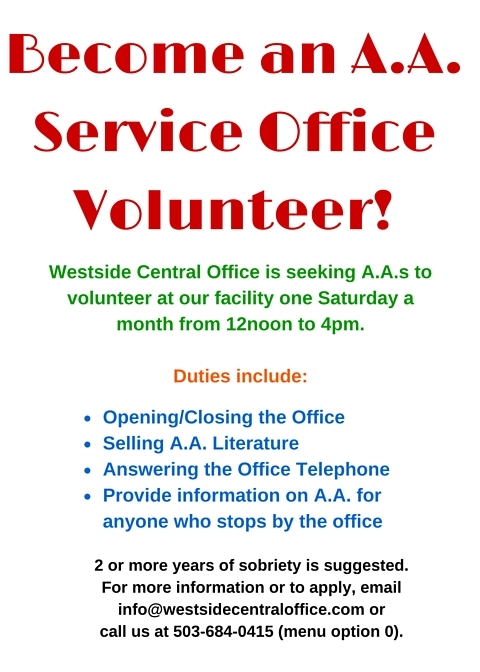 Click here for other service opportunities at Westside Central Office. Another informative 7th Tradition Workshop sponsored by the Westside Central Office is in the books. Joe S hosted another great workshop and Renee K provided the refreshments. Attendance was a little light (5 attendees), but everyone who did attend was engaged and enthusiastic. The handouts from the workshop are available here. Please share these handouts with your home group and feel free to contact us with any questions/comments you have on these documents. This month marks the one year anniversary of our newsletter, Into Action! If you have not checked it out yet, please do so by visiting the Newsletter web page (or by clicking the Newsletter tab at the top of this web page). You can view the current issue, back issues, and sign up to receive the monthly newsletter by email. Special thanks to Hailey F for producing our monthly newsletter. She is always looking for articles, upcoming events, jokes, comics, etc. for the newsletter. To submit an item for publication consideration, email it to newsletter@westsidecentraloffice.com. 12th Step Call Committee Chair – Maintains a list of 12th Step Call Volunteers for participating groups, receives calls from Hotline volunteers and refers 12th Step volunteers to incoming calls. A.A. Hotline Committee Chair – Maintains a calendar of individuals and groups willing to answer the Westside Central Office phone. Activities Committee Chair – Organizes, runs, and promotes all service workshops and social activities of the Westside Central Office. Co-Chair – Assists the Chair with their duties as well as fill in for the recording secretary when the secretary is absent from the business meeting. Corrections Committee Chair – Leads a committee that carries the A.A. message to alcoholics behind the walls of correctional institutions. Finance Committee Chair – Works closely with the Westside Central Office treasurer and other officers to establish annual budgets, prudent reserves, and accounting practices for the Westside Central Office. Newsletter Committee Chair – Publishes the Westside Central Office’s monthly newsletter Into Action! Outreach Committee Chair – Informs the A.A. Groups of who we are, the services that we provide, and how each A.A. Group can get involved with Westside Central Office. Recording Secretary – Records the minutes of the Westside Central Office business meeting, emails minutes to business meeting attendees, and provides hard copies of previous meeting minutes at each business meeting. All positions will serve through September 30, 2014. Detailed job descriptions for each service position are available here. Interested candidates are encouraged to submit their service resume at the September 2, 2013 business meeting or by email at info@westsidecentraloffice.com. You may also contact us for more information.